Assembly of a light-lift Vega has begun for the sixth flight of this smallest vehicle in Arianespace’s launch vehicle family, which is scheduled for November and will send Europe’s LISA Pathfinder on its way for a pioneering space science mission. The build-up process commenced when Vega’s P80 solid propellant first stage was moved to the Spaceport’s ZLV facility and positioned on the launch pad. A transporter vehicle moves Vega’s P80 first stage to the Spaceport’s ZLV launch complex, where the solid propellant stage was positioned on the launch pad to begin the launcher build-up process for Arianespace’s Flight VV06. This will be followed by stacking of the launcher’s solid propellant second and third stages, as well as integration of the Attitude and Vernier Upper Module (AVUM) liquid bipropellant upper stage – and then the “topping off” with its passenger: LISA Pathfinder. Vega has previously been launched five times from French Guiana – deploying a full range of satellite payloads since its introduction at the Spaceport in 2012. 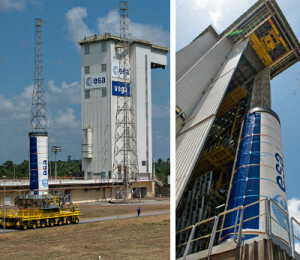 Arianespace’s lightweight launcher is produced under the responsibility of industrial prime contractor ELV, a company jointly owned by Avio and the Italian Space Agency. For the November mission, identified as Flight VV06, Vega will place the European Space Agency’s LISA Pathfinder in a slightly elliptical parking orbit. The spacecraft subsequently will use its own propulsion module to reach the final operational orbit: a 500,000-km.-by-800,000-km. halo orbit around the first Sun-Earth Lagrange point, 1.5 million km. from Earth. Once operational, LISA Pathfinder will help test and validate the technology in space needed for detecting low-frequency gravitational waves, which are ripples in space-time predicted by Albert Einstein’s theory of general relativity. Test masses carried by the spacecraft will be put in a near-perfect gravitational free-fall, controlled by electrostatic fields. LISA Pathfinder’s onboard sensors and systems will control and measure the masses’ motion with unprecedented accuracy.